After a truck loaded with bricks slammed into the rear of a car on the New Jersey Turnpike and caused a chain-reaction crash that killed four people, including a toddler, the families of the deceased were sued by the turnpike authority for damage to the highway. The move horrified both the families and the public. A turnpike spokesman called it a “stupid mistake,” and the suit was withdrawn. As if billing Newark for thousands of dollars in travel wasn’t enough, prosecutors said former Newark Mayor Sharpe James also billed the city for pornographic movies and body lotions while in Miami. James’ lawyer said, “What the heck does it matter if he watched an adult movie?” As we say in The Soprano State, only in New Jersey. Federal monitoring of the University of Medicine and Dentistry of New Jersey ended Dec. 31. U.S. Attorney Chris Christie said law-breaking has ended “at this time.” As for ethics, that “still needs substantial improvement.” The cost of the monitoring, $8.5 million. Joe Doria was back in the news when his state Department of Community Affairs gave all but $1.07 million of $16.3 million in special aid to municipalities in Democratic-controlled districts. Bayonne, where he served as mayor, got $1.3 million. DCA said politics played no role. Flashy real estate broker Anthony Spalliero pleaded guilty to paying former Marlboro Township Mayor Matthew V. Scannapieco $100,000 in bribes for zoning approvals for home building. 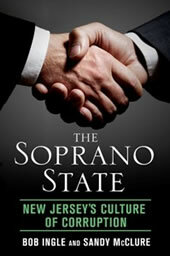 “With large sums of bribe money, Spalliero bought the votes and influence of the mayor on critical development projects that changed the landscape of one of the state’s fastest growing municipalities,” said U.S. Attorney Chris Christie. Former attorney general Zulima Farber, who lost her job after she rushed to the scene of a traffic stop involving her boyfriend -- the one driving without a valid license or registration -- is back in the public’s business. She landed a job as special counsel to the public schools in Elizabeth, the city where she used her connections after the incident to get the boyfriend special service at Motor Vehicles. The confirmation of New Jersey’s first comptroller in 60 years, Matthew Boxer, was held up after Boxer went mum on his role in getting Rocco Riccio, the brother of Gov. Corzine’s ex-girlfriend, off the state payroll. Riccio received $15,000 from Corzine and his personal business manager, some of it in $1,000 money orders. Larry Hazzard, the state’s internationally respected boxing commissioner, was fired by the attorney general after he complained about conditions that were putting the health of boxers at risk. A federal lawsuit accused Joe Doria, former Bayonne mayor and longtime lawmaker now running the state Department of Community Affairs (the agency that doles out grants) of firing parking authority workers who helped with at ticket fixing probe. The suit charged that when the two workers reported the misconduct to Doria, he told them to shut up. Gov. Corzine’s attempt to milk the state’s toll roads for revenue could result in tolls increasing by more than two-and-a-half times. Showing he has no regard for those who will pay the tolls, Corzine tried to keep a draft document about the plan – paid with $887,000 in taxpayer money – secret. Karen Golding, the woman Gov. Corzine gave $5,000 for jail bail, pleaded guilty to stalking the state Democratic Party chairman’s girlfriend. Jim Treffinger, the former Essex County executive who served time for obstructing a federal probe and putting no-show employees on the payroll, joined Jim McGreevey in a quest for the ministry. Treffinger enrolled at Princeton Theological Seminary. Bernard Kerik was indicted on federal charges that he abused his position as New York police commissioner. Kerik’s downfall and failed nomination for homeland security secretary stem from his connections to two New Jersey brothers whose construction company has been linked to the mob. Former Atlantic City Mayor Robert Levy pleaded guilty to lying about being a Green Beret and using those lies to boost his veterans’ benefits. New Jersey prosecutors accused four Jersey City judges of fixing tickets not just for their friends but also for themselves. Nearly 2.5 million cubic yards of contaminated materials have been trucked to the EnCap golf resort and housing project in the Meadowlands as the state Department of Environmental Protect granted a series of breaks to the company, whose parent is the politically influential Cherokee Investment Partners. Former assemblyman and preacher Alfred Steele, of Paterson, pleaded guilty to accepting a $15,500 bribe in exchange for helping an insurance company get government business. The problem for Steele: the company wasn’t real. It was a front for the feds. A Baptist minister, Steele was caught in a federal sweep that charged 11 local and state officials with bribery.